Like Puerto Rico, the U.S. Virgin Islands are U.S. territories. Many mainland Americans are aware of this. However, they don’t know the history of the islands, especially its slavery past. Though the slaves were treated cruelly, they had numerous triumphs – many of them heralded by women – eventually causing enslavers to abandon the institution. In 1917, the United States bought the Virgin Island territories from Denmark for $25 million (nearly $500 million in today’s dollars) as a strategic position against a European invasion. There wasn’t a battle, war or takeover. Beforehand, however, ownership of the various islands changed hands more than once. The island of St. Croix alone flew under seven different flags. There was Columbusing in 1493. In the early 1600s, the British and Dutch struggled over St. John and St. Croix. Midway through the 17th century, the French took over, quite unsuccessfully – most of their colonists became sick and died. Ten years later the governor of St. Kitts purchased St. Croix as his private estate, then deeded it to the Knights of Malta. Pampered aristocrats, the Knights had no idea how to govern a colony. The French would repurchase the island in 1665. In 1733, St. Croix was considered abandoned, and the French sold the island to the Danes. “The Danes learned how to work the land and soon sugar plantations started to become successful, which means they needed laborers,” says Alani Henneman-Todman of the USVI tourism board. “Over time indentured servants and African slaves were brought over. Conditions on the islands were harsh and many slaves tried to escape in the bush. Legend has it, Henneman-Todman says, that the most rebellious slaves lived on St. Thomas, keeping slave masters busy putting down revolts. One of the coolest outlooks on St. John today is of Coral Bay. It is a lush and sheltered port, attracting locals and expatriates because it’s more difficult to get to than other parts of the island. It’s also the site of one of the most famous slave revolts on St. John. It started in 1733. Frustrated slaves captured the fort in Coral Bay and took control of most of the island. The slaves methodically took over all of the island plantations until they controlled St. John for nearly nine months after which French and Swiss troops from Martinique came to restore the island to the slave owners. Visit the ruins of the Annaberg Plantation located within the grounds of the National Park and it soon becomes clear how miserable the conditions would have been for slaves working at the sugar plantation. During the summer, humidity and temperatures are high. It would have been sweltering in the sugar mills. No wonder the slaves devised an escape plan! Of course, vacationers can leave anytime they please. Many are familiar with Harriet Tubman and the Underground Railroad. But perhaps not with Kitty, Polly and Katurah. Their story involves a boat and plan to lead one of the largest slave escapes in Virgin Islands history. In 1838, the British freed the slaves of their West Indies territories (Tortola, Jost Van Dyke, Virgin Gorda and Anegada) and it wasn’t long before slaves on neighboring islands learned of the news. So thank you, but no thanks – the group decided to stay. Well, most, anyway. Eventually some returned home, but it’s not clear why. Reports indicate that they were not punished, just as the officials who coaxed them back promised. Eight years after this revolt, freedom came to the Danish West Indies. On a trip to St. Croix’s Fort Fredrik, you’ll learn more about the Emancipation. In 1848, the Danish Parliament created a 12-year plan under which slavery would slowly be dissolved. But the slaves refused to wait. On July 2, 1848, slaves leading the revolt blew conch shells and rang estate bells to alert comrades that it was time to march. “Everybody left their plantations and gathered here and by six or seven o’clock in the morning there were about 8,000 enslaved people gathered around this fort,” says Gerard. Along the way slaves set fires and destroyed parts of town and plantations of slave owners, judges, policemen and others who’d mistreated them. Many whites fled the area. On July 3, the St. Croix revolt forced officials to end slavery immediately. But the rebellion on the island didn’t end there. The slaves’ original march to the fort began as a nonviolent uprising, though property was destroyed. Also on July 3, soldiers fired on groups of protesting slaves. From July 4 to July 7, slaves continued pillaging plantations. Eventually, calm returned and slavery officially ended, according to the government. Today, Frederiksted is known as Freedom City. Much like Reconstruction in the mainland United States, freedom barely improved the lives of the former slaves in the Danish West Indies. So three women, Mary Thomas, Axeline Elizabeth (Agnes) Salomon and Mathilda McBean, led a revolt in 1878 during which the city was burned. Today, they’re known as the “queens.” The revolt is known as “Fireburn.” Houses, fields, sugar mills and stores on nearly 50 St. Croix plantations were set ablaze. Over half the city of Frederiksted was left in ruins. Today, many Danes visit St. Croix for holiday. “They still look at this as their islands. Back home they are told about how the Virgin Islands once belonged to their country,” says Gerard. “Unfortunately, they aren’t told the entire history. When they learn of it here at the museum they are devastated. Some even walk out of the tour. It’s a shame their history books leave this part of the story out. 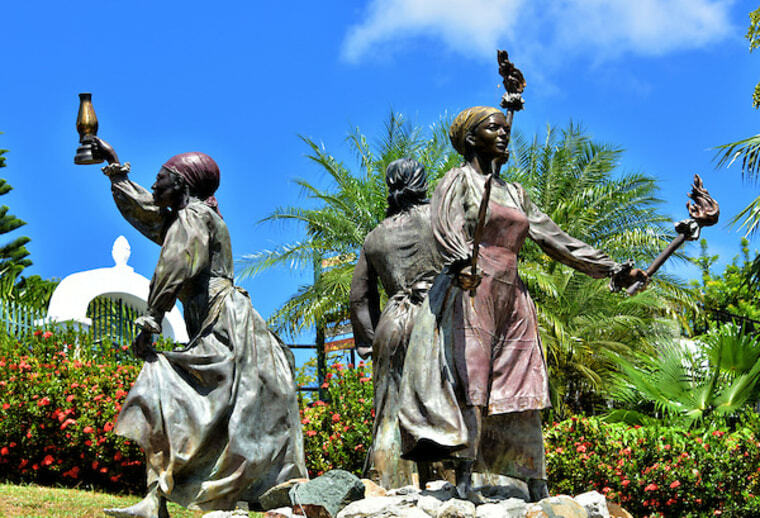 USVI celebrates Emancipation Day on July 3. Some of these triumphant freedom tales are a part of the tradition. And in true Caribbean fashion, there is a carnival.